Belgian police have detained 12 people overnight on Friday 06/17/2016, on suspicion of preparing new ‘terror attacks’ in the country. 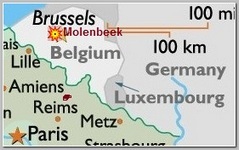 Searches were conducted in 16 municipalities, mainly around Brussels, with checks on 152 lock-up garages., Arms or explosives are said to have been recovered. A total of 40 people were questioned by police amid the raids. According to a report by public broadcaster RTBF (in French), terrorism suspects were seen driving on Friday near a fan zone in central Brussels, where Saturday’s 06/18/2016 Euro 2016 match between Belgium and the Republic of Ireland is due to be relayed from France by giant screen. The warning of possible impending large-scale attacks came the day after a French police commander and his partner, also a police employee, were stabbed to death in their home near Paris. The assailant, Larossi Abballa, was killed by police, but not before he posted a 12-minute rant on Facebook Live, promising “other surprises for the Euro” and calling on followers to “turn the Euro into a graveyard,” a reference to the Euro 2016 European soccer tournament now taking place in cities across France. ** Belgian authorities, eventually, have charged only three men with terrorism offences, including attempting to commit murder, following the operation. Nine other people who had also been arrested have been released by the investigating judge, the federal prosecutor’s office said on Saturday 06/18/2016..